"Often the hardest part," Graham Murawsky says, "is just getting down to the studio and starting something." Better known in the underground alternative hip-hop scene as Factor, the Side Road Records head honcho and Fake Four Inc producer has overcome this challenge plenty of times since his first "official" studio was set up in his parent's basement around 1998 in Saskatoon, SK. "It was pretty awesome!" he exclaims of Factor G Studios, which originally consisted of his early DJ equipment (a used Radio Shack mixer and two turntables, one from a garage sale and the other a Gemini direct drive) plus a Fostex digital four-track, a Shure SM57 mic, a Roland SP-808 and another "weird" Roland synth. As his DJ skills improved, he upgraded to a pair of Technics 1200s and a Vestax PMC-06T mixer, and as he became more serious as a producer he got a Korg Triton, which he loved so much he sold both Roland synths and upgraded to an M3, which has become his main production tool. 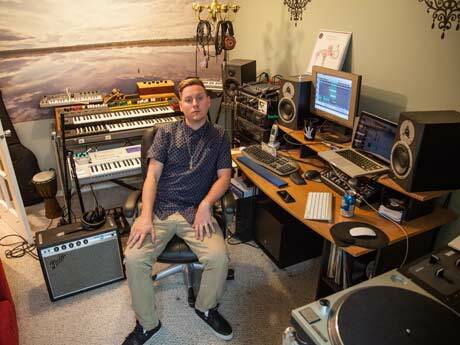 But Factor's current studio for the past seven years has been Chandelier Studios, "a pretty humble [home] studio" equipped with his prized Korg M3, along with computer programs Pro Tools and Cool Edit/Adobe Audition, his 1200s and a Rane TTM-57SL mixer, a Universal Audio LA-606 pre-amp, a vintage Yamaha Organ, effects pedals, a bunch of random synths and noise makers, a couple of different sets of monitors, drums, mics, plenty of vinyl, some vintage amps and "whatever else I can make noise with," he says. And there's always room for more: "I wanna get my hands on some more new stuff soon!" he admits. "[I] love new synths. Always inspiring to get new equipment and have a slightly different sound or option to use." Though the name of his studio has changed, as has the location (a few times), Factor's studio remains in his small home town. And why shouldn't it? After all, Saskatoon has been an important element in Murawsky's development as he made that all-too-familiar "natural transition" from a mixtape DJ looping and blending samples and sounds to full-fledged producer. "Living in Saskatoon definitely gave me the freedom to develop my sound and realize what kind of music I wanted to make," he explains. "My working process and vibe is different from season to season. In the winter I am making a lot different beats than [in] the summer." Not surprisingly, his resulting production process is pretty organic, too. "Whether it is chopping up samples, playing synth, or working with session musicians," he says, "I try and go with whatever vibe I am feeling at the time." And since much of his body of work involves collaborations with legendary underground MCs such as Freestyle Fellowship's Myka 9, Awol One of the Shapeshifters, Moka Only and Ceschi — and, not to be pigeon-holed, singer-songwriter Gregory Pepper — Factor must also consider what will "complement the artist's style, as well as what's best for the whole project," he says. "I find projects definitely come out better with lots of communication and throwing ideas around. Always dope to try new things and keep it fresh." It was this desire to maintain forward momentum that partly prompted Factor to introduce live instruments into his music while working with Awol One on Owl Hours in 2008. "I wanted to have a different sound for the album," he explains, "and to have some sample-free music so that I could try and get some publishing or placements." While Factor chops samples and plays synths, he admits he has no formal music training so whenever he requires live instrumentation, he seeks the services of studio musicians or his band the Chandeliers (bassist Enver Hampton and guitarist and violinist Levitron). Chandelier Studios is equipped with a small vocal booth with a good mic and compressor, which means Factor can get a quality sound when recording both vocals and instruments, but he also "gets lots of vocals and instruments that get recorded at random studios and then emailed," as it's often more cost- and time-effective. "The majority of the magic is in the mix after the recording," he says. "A lot of times I will fly in for the final mixes, or vice versa." It's a method that allows him to continue to reside in Saskatoon, and that final personal touch to the mix is a rarity in this digital age that must surely help with the sound of the final product. Factor's collaborative practices and organic method of production have artists returning for his services, a sure sign his method is effective, but for Factor it always begins with beats. "I like making beats," he states simply, "with samples, sample-free, samples and live instruments, whatever sounds dope. Stay original."